"Only crime and the criminal, it is true, confront us with the perplexity of radical evil; but only the hypocrite is really rotten to the core." J Street executive director Jeremy Ben-Ami disavowed support for Peter Beinart's recent settlement boycott call in an interview with American Jewish establishment bouncer Jeffrey Goldberg just days before Beinart's official book release event at J Street's annual conference. Because I don't think that it makes any sense to put negative pressure on people whose behavior you hope to change. I think that the way that Israelis will feel comfortable making the compromises and the sacrifices--and Israel as a whole, not just the settlers --is when they really feel that not only American Jews, but the United States, is going to be there for them. I think if you begin to do things that say, "We're not really with you, we're against you, we're putting pressure on you," I think that causes people to pull more into a shell and pull back. Ben-Ami added that when the "Jewish people" feel "under pressure, under criticism, under attack," they will "get defensive" and respond stubbornly and aggressively to such pressure. "Rather than it making you more inclined to do something, it actually makes you less inclined," Ben-Ami says. So, according to the so-called "liberal" wing of the Zionist community in the United States, Jews don't respond well to "negative pressure" over the continued Israeli ethnic cleansing, occupation and colonization of Palestine. In fact, the rights-based approach of the BDS movement, in Ben-Ami's opinion, will only cause Israel and its Jewish supporters here in the U.S. to become less amenable to the basic tenets of non-discrimination, human rights, self-determination and the rule of law. Yet, when Ben-Ami claims to believe it is counter-productive and self-defeating "to put negative pressure on people whose behavior you hope to change," his opinion doesn't appear to apply to all people, but only to Jews. Such a quirk of human nature certainly doesn't extend to Iranians. If it did, one would assume Ben-Ami wouldn't so strongly advocate for and support the multiple rounds of sanctions implemented on the Islamic Republic. Of course, thirty years of increasingly draconian sanctions against Iran is a textbook definition of "negative pressure," and this kind of pressure - when the target is Iran, not Israel - is the kind Jeremy Ben-Ami has no qualms encouraging. But, even more importantly, let's all be clear: Israeli settlement of Palestine is illegal in the extreme; not a single government or international organization on the planet other than the offender itself recognizes such colonization as legitimate or lawful. Iran's nuclear energy program, however, is fully legal, constantly monitored and inspected, and is not weaponized. While BDS calls for Israel to respect international law, sanctions against Iran explicitly abrogate it. In a statement released October 16, 2009 regarding the latest "Iran Refined Petroleum Sanctions Act," Ben-Ami himself declared that, if coercive "engagement" over Iran's nuclear energy program (read: Iran kowtowing to Western diktat) fails to produce the "desired result," then "the United States should seek hard-hitting multilateral sanctions" followed by "[t]he imposition of unilateral sanctions, without UN approval or the support of allies." He also reiterated that, while his organization encourages "diplomatic engagement and multilateral action" with regard to Iran, "J Street does not oppose the imposition of sanctions per se." Two months later, when asked why J Street supported new sanctions on Iran, Ben-Ami claimed that Congressional bill "gives the president this tool, this additional tool, to work with in trying to convince the Iranians that there's no time." Perhaps he believes that Iranians, by virtue of not being Israeli, consider sanctions to be positive pressure. But probably not, considering Ben-Ami, in the same interview said, "Well, there's no question that the sanctions ultimately does hurt people," adding, "This is also important in putting a real squeeze on the government." Apparently Ben-Ami believes that the time Iranians have to capitulate to Western demands to give up its sovereign, national rights is short, while the Israelis have plenty more time to decide to stop their century of colonization and "pressure" might make them more dismissive of the Geneva Conventions, Nuremberg Principles, United Nations Charter and the Universal Declaration of Human Rights. On May 20, 2010, Ben-Ami praised the prospect of new U.N. sanctions on Iran, saying that J Street has "consistently believed that the most effective signal to Iran of the need to change course on its nuclear program is for the international community – through the United Nations Security Council – to approve and enforce tougher multilateral sanctions against Iran, combined with a willingness to engage in meaningful diplomacy." Once the sanctions were passed, Ben-Ami wrote, "J Street welcomes the passage of enhanced multilateral and broad-based sanctions on Iran." On June 24, 2010, after Congress passed its latest unilateral "Comprehensive Iran Sanctions Accountability and Divestment Act," J Street released a statement welcoming the bill's passage and urged "swift Presidential approval." During a December 13, 2010 interview with The Jewish Chronicle, Ben-Ami accused Iran of "funding the troublemakers" and "egging on those who are trying to inflame the [Israeli-Palestinian] conflict because it serves their interests." Keep in mind this is coming from the head of a group whose official position is that "Israel’s settlements in the occupied territories have, for over forty years, been an obstacle to peace" and which have "eroded the country's ability to uphold the rule of law." With so much funding for settlements coming from U.S. taxpayers, as well as the Israeli government massive subsidization and ongoing encouragement of colonization, Ben-Ami's finger-wagging at Iran is patently absurd. He also said Iran is pursuing nuclear weapons, which literally isn't true. 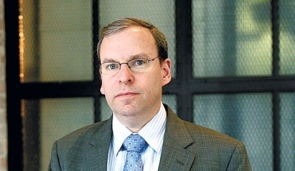 Furthermore, when asked point blank whether J Street is "opposed to sanctions," Ben-Ami was quick to insist no such opposition existed, declared that "the charge against J Street that we don't support sanctions is untrue," approvingly described sanctions legislation as "a threat" against Iran, and advocated in favor of actions through which Iran is subjected to "a series of measures that make it very clear what the costs are." He also credited J Street with lobbying 40-50 members of Congress to vote for unilateral sanctions against Iran. Obviously, Ben-Ami doesn't believe Jewish colonists in Palestine should be subject to such ultimatums, threats, and pressure. In early March 2012, Ben-Ami told the New York Times that J Street was "trying to calm down the drumbeat of war" against Iran by allowing "time for enhanced sanctions and diplomacy to work." It appears that the "liberal Zionist" Ben-Ami and J Street only oppose "negative pressure" when the intended targets are fellow tribesmen and not millions of mostly Muslim Iranians. How liberal! May 31, 2012 - Today, J Street praised a vote in the House of Representative that authorized a "reporting requirement as an amendment to the Intelligence Authorization Act (H.R. 5743)" which "requires the Director of National Intelligence to submit to Congressional intelligence committees a report containing an assessment of the consequences of a military strike against Iran within 60 days of the passage of the overall bill." The amendment was introduced by Representatives John Conyers (D-MI), Keith Ellison (D-MN) and Barbara Lee (D-CA) and was both supported and lobbied for by J Street in the hopes for preventing a military assault on Iran. As far things go in Washington, the passing of such of an amendment should be commended. In the statement by J Street, the lobbying organization continued to advocate for further punitive and coercive measures to be imposed on Iran over a nuclear energy program that all available intelligence affirms is not weaponized or in any way illegal. The statement describes J Street as "lobb[ying] in support of a combination of tough, targeted sanctions and diplomacy to prevent Iran from obtaining nuclear weapons." Still no word on when Israel's 45-year-old colonization project in the West Bank, let alone its continuing century-old campaign of ethnic cleansing - unequivocal war crimes and crimes against humanity wholly supported, defended, and in large part funded by the United States government - can expect to receive the same level of concern and pressure from J Street. The new joke at Aipac is, "Laughing when Syrians kill each other is NOT Antisemitism."